Ah yes, I’m glad these woods carry honey mushrooms. And look, freshly stocked … no line either! 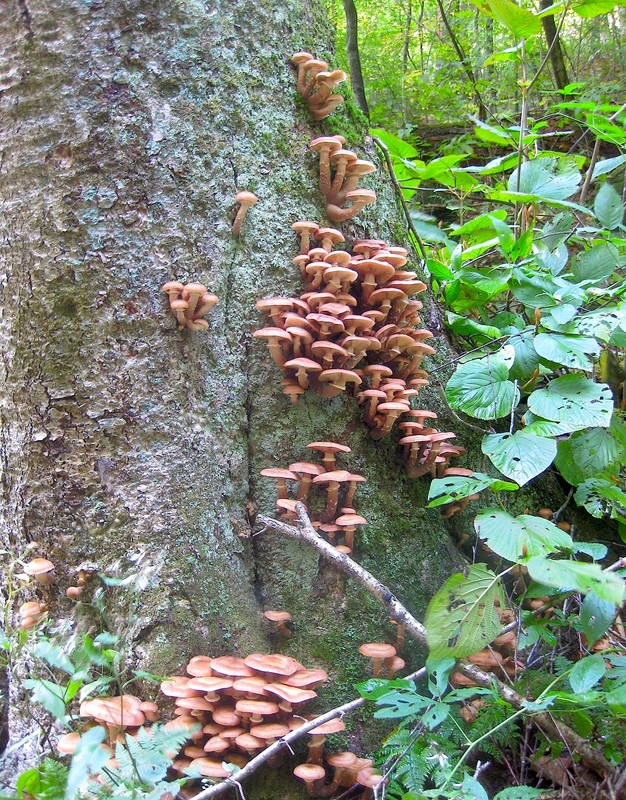 Honey mushrooms are part of a species complex (Armillaria mellea complex), incorporating at least a dozen distinct species. They share characteristics, however, that can be used to tell them apart from other mushrooms in separate genera: Honey mushrooms have a veil (unless they’re ringless honey mushrooms … a separate species), they usually contain small dark hairs on the cap, they grow in clusters on wood – though the wood may be buried, and their spore print is white. They’re a prized edible, somewhat resembling shiitake mushrooms (cooked, of course). They’re also quite medicinal. Research has shown that a water-soluble polysaccharide from the honey mushroom exhibits a potent tumor inhibitory effect on human lung cancer cells (Wu et al., 2012). The mycelia (the fungal “root-like” network) possesses an antibiotic compound, armillaric acid, that is effective against gram-positive bacteria and yeast (Obuchi et al., 1990). Honey mushrooms also contain the biologically active compounds tryptamine, L-tryptophan, and serotonin (Muszynska et al., 2011). This is not generally considered a “beginner’s mushroom.” It may be confused with the deadly Galerina (Galerina marginata), which, as its name suggests, is one of the most poisonous mushrooms in the forest (and was growing not too far from this spot). The deadly Galerina is more fragile than a honey mushroom, has a smoother cap, and produces rusty-brown spores. For positive identification, field guides are great, though trusted mycological identifiers are the best. Long live the autumn mushroom season!